12th Bn, attached 8th Bn, The East Lancashire Regiment, 112th Brigade, 37th Division, B.E.F. Nature of Death: Killed in action Beaumont-Hamel, France 15/11/16(*). The Malvern News reported: “Mr J East of Holly Croft, Bank Street, Link Top, Malvern has received official notification from the War Offices that his son 2/Lt W F E East, East Lancs, was killed in action 16th November. Before enlisting the deceased was a school-master at Darwen for 19 years and some years was Assistant Schoolmaster and Organist at Hove. In July 1915 he joined the Public School Corps and served in France from October 1915 to February 1916 and was then transferred to England to an Officer Cadet Camp. After his commission in July he joined the East Lancashire Regiment in France. He was 42 years old and was a prominent member of Darwen Literary Society. “May I be allowed to express my deep sympathy with you in your great loss and also to say that 2/Lieut East was always admired and praised by our officers and men of this Battalion for the conscientiousness and fearless manner in which he carried out his duties. He had gone back to rally the man after we had got into our own barrage, when he was shot in the head and died instantly. (*)Further research shows that the Battalion attacked Munich and Frankfurt trenches on the 15/11/16, and as the war diary states: “The forward wave got up to within 50 yards of Munich Trench when our field gun barrage commenced. 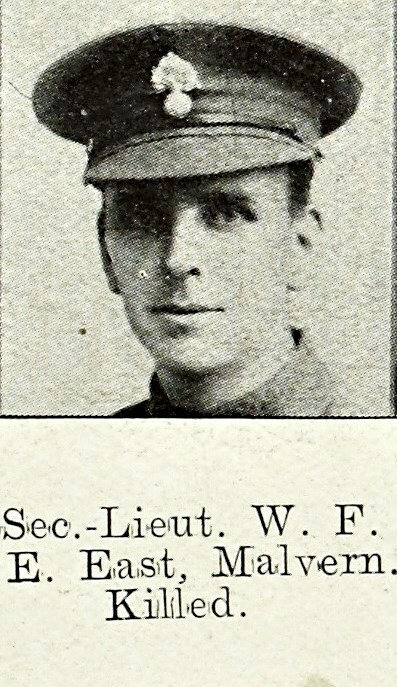 It was owing to the barrage being short, the thick fog and the wire in front of the trench being uncut that the main attack failed.” This reference to the barrage falling short would corroborate the evidence of 2/Lieut Loudon that 2/Lieut East was rallying them men after they had got into their own barrage. The remainder of the day, and the 16th was spent consolidating the line and on the night of 16th/17th a unit of the Border Regiment relived the East Lancs Battalion. It is therefore safe to assume that William East was killed on the 15th and not the 16th as official sources state. Despite the initial cover of fog, giving the East Lancs the element of surprise, the attack was costly. As soon as the enemy discovered the attack they opened up heavy machine and rifle fire. Ten officers were killed and by 10am the attack had ceased, with no ground gained. The only consolation being a handful of German prisoners.